Never one to pass up a new art pen, the Kuretake Zig Cartoonist Mangaka Outline Pen is the latest to hit my desk. I have tried many over the years - most are good, a few not so much - but even fewer are elite. The Sakura Pigma Micron comes to mind at the top of the list and it might now have company. My test subject was the 02 Violet. Like many pens in this category, the barrel is no great shakes. The most important thing it can do is stay out of the way, and the Zig Cartoonist does just that. It is lightweight and comfortable, and even does a nice job in the grip area by not having any sharp edges like so many of its competitors. Where this pen really shines is in the tip. It is very firm and performs exceptionally. My lines were tight and look great on the page. I haven’t put it through a true use durability test to see how it holds up over the long term but I am not seeing much breakdown in the tip so far. And have you noticed the color? 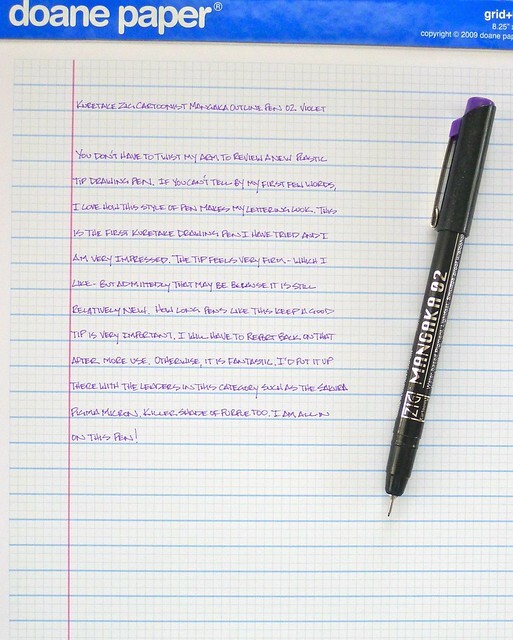 I am a fan of purple inks, and this is one of the best I have seen. So what’s next for me and the Kuretake Zig Cartoonist? I am going to try a few other colors and tip sizes and see if I can get a better gauge on its durability. Look out Micron - I’m coming for you! Posted on June 22, 2012 by Brad Dowdy and filed under Drawing Pen, Kuretake, Pen Reviews, Zig.